After Barcelona, Spain we took a 1.5 hour train ride to the city of Valencia. We arrived late in the afternoon and enjoyed a delicious local meal (food post to come). Since it was the night of the Final de la Champion for soccer (congrats FC Barcelona for winning! ), we watched the game at a local bar downstairs from our apartment. The next day, we toured the city and visited the local attractions. There were so many great architecture here that were all nearby in the Cuidad de las Artes y Ciencias. See below for the popular travel spots to check out! Are you more into: museums or city landmarks? Museums are always interesting but I'm finding that historic landmarks intrigues me more. I think it's cause I used to want to be an archaeologist when I grew up...but then I realized you have to get "dirty" and changed my mind quickly after that (haha). [Plaza de la Reina] Our apartment got to overlook the courtyard and the futbol celebration parade! 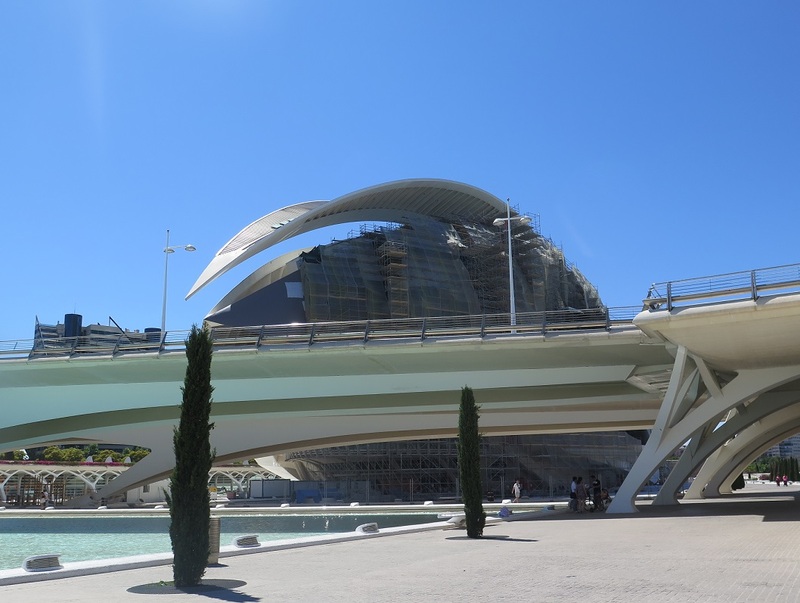 [Palau de les Arts] Since it was a holiday, we couldn't go inside (boo) but you can read more about it HERE. [Agora] A multifunctional space for events including concerts, conventions, and performances (HERE). [Museo de las Ciencias] This architectural building will definitely catch your eye (more HERE). [Hemisferic] So cool, they had a concert in the water there the night before! More details HERE. [Umbracle] The "Art Promenade" which displays contemporary art, a wooded garden, and astronomy-related details (more HERE). [Playa de la Reina] First time at the Mediterranean Sea and it was a beautiful beach day for a light swim. There is also the ever-so-popular L'Oceanografic (not pictured, read more HERE) which happens to be the largest aquarium in Europe and a total must-see HERE! I'm still bummed it was closed when we went because that would have been an amazing experience - hopefully next time. If you love animals, add it to your Valencia, Spain travel list!